The Oregon Vortex was an absolute must-see for this trip. When I was in junior high, my sister and I would watch the travel channel constantly. We both made mental and physical lists of the places we had to go see some day. And the Oregon Vortex was on just about every episode of any show with “weird” “strange” or “unusual” in the title. It was a place in southern Oregon where people appeared to change height and balls seemed to roll uphill. 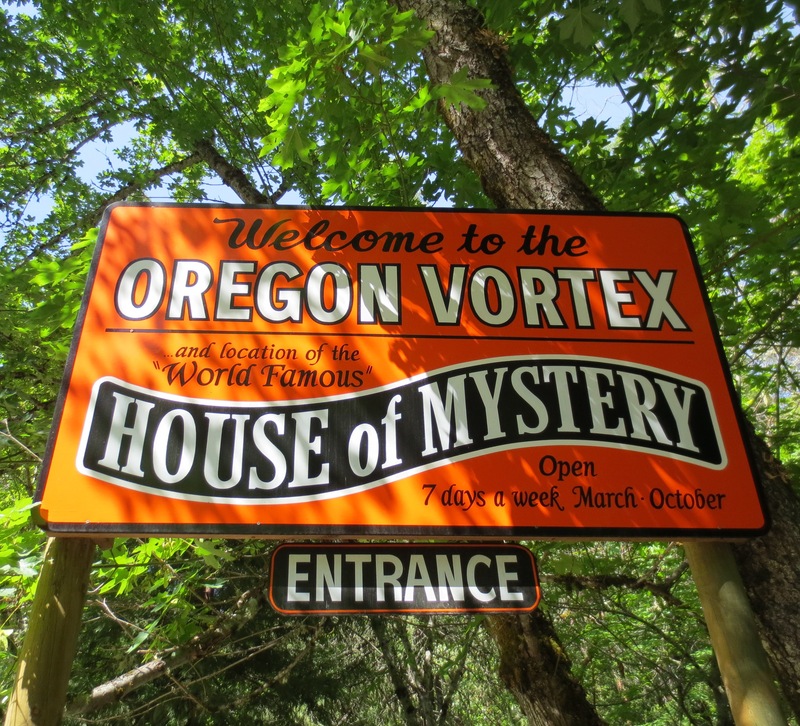 Signs for the vortex and the “World Famous House of Mystery” are seen from the highway, and the attraction itself is about four miles in from the main road, through a sleepy residential area. As I drove, the road became a bit bumpy, I slowed down, and the road was bumpier still. Then there was the smell. With no shoulder to pull onto, I stopped the car, turned on my emergency lights, and got out to find my left rear tire completely shredded. Ashland locals would later jokingly accuse me of getting too close to the Vortex. Basking in the smell of hot, burnt rubber, the required moment of shock was quickly taken over with resolve. This was bound to happen at some point on my trip, it might as well happen now. There may be no shoulder, but the road itself was pretty quiet, so passing cars wouldn’t be a huge issue. It was 80 degrees, but it could be hotter. I was on my way somewhere, but I was also ahead of schedule. I began the slow process of moving everything I was storing in the trunk into the cab of the car so I could reach the tire. I pulled out the tire, the included tools, stared blankly for a moment, then moved over to the shade to figure out how the jack worked. Now of course I’ve changed a tire before, but that was on my old Toyota Camary. And it was 10 years ago. I resigned myself to the fact that this was likely to be a slow and stumbling process, and started to feel under the car for the best place to put the jack. I just barely had metal touching metal when two guys came walking up to the road from a nearby driveway. They asked if I wanted some help, and quickly took over the process at a rate that made my jack placement look laughable. It was clear from the start that these guys knew cars, and I had no problem standing back and watching. I offered them some Lysol wipes to clean their hands, and they were on their way. It all went by so fast I didn’t think to take a single picture. With all my belongings now visible, I considering going straight to a tire shop that minute. However I was already so close to the Vortex, and when I arrived I was able to park in direct view of the ticket taker, so I felt it was an acceptable risk to wait until after to get the tire repaired. 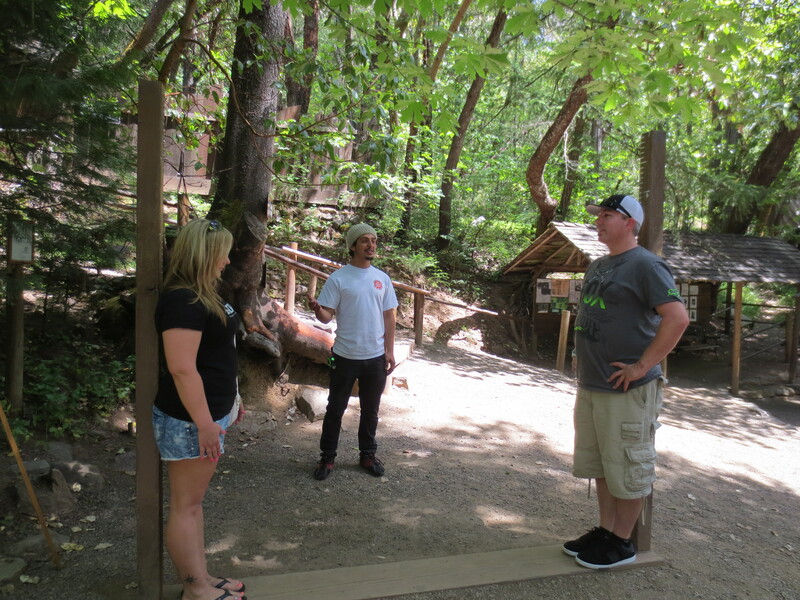 The Oregon Vortex and the House of Mystery are shown by guided tour only. You’re allowed to take photos, but no video “for copyright purposes.” The guide starts by showing you a trick with magnets that has nothing to do with the Vortex but is still fun science. He then proceeds to guide the group through a series of demonstrations with explanations about the magical properties of the area, and how everything we see “cannot be completely explained by science.” We go into the Mystery House, which is supposedly an old mining office that fell off it’s foundations. It is, let’s face it, a total trip to walk through. 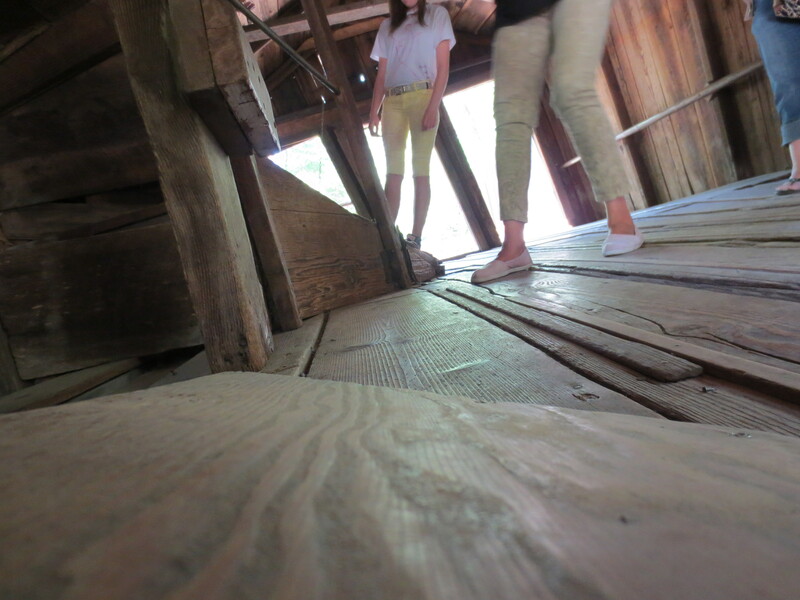 The angle of the floor is very steep, which makes keeping your balance a fun exploration. No matter how long you stare at it, you are never able to figure out the real shape of any line or angle in relation to gravity. The guide led us through some more height changing demonstrations, some of which I got to participate in. Even as the person in the demo you really do feel like your height in relation to the other person has changed. For his part, the guide seemed to be genuinely amazed that I was there by myself. He kept asking if I wanted him to take a picture, or if he’d like someone to take a picture of the two of us so I wouldn’t be alone in the photo. His confusion and pity was a huge source of entertainment for me. I am the Katrina Vortex. Known science cannot explain how I am able to enjoy activities without a supportive second human. Later, I looked up the vortex on Wikipedia, which explained that it’s one of many spots in the world where your mind is easily tricked into optical illusions because of oddities in the way the plants are growing with respect to gravity. This of course wouldn’t account for the demo he had me do with my eyes closed, but it wouldn’t be a very interesting attraction if there was a quick answer to everything. In the end, I think I would most directly compare the Oregon Vortex to watching a magic show. You suspect you’re being tricked, and if only you could think of just the right question to ask you’d be able to figure it out. But you don’t try that hard, because you know that the truth wouldn’t be nearly as much fun as the mystery.